The best steak I’ve ever had! I know it is a bold statement but I’m not lying… that steak, 55 day dry aged in a salt cave, was amazing! It was tender, juicy and down right delicious! My brother is visiting Chicago for the first time this weekend… to celebrate his birthday, we went to David Burke’s Primehouse… from start to finish we were astounded by the quality of the food, service and atmosphere. 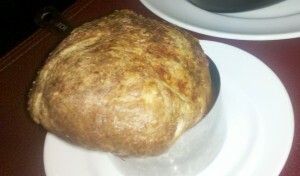 We were started off with a cheddar popover cooked in a metal measuring cup… a simple and fun presentation. I love popovers, so of course, I was already happy with this restaurant. For our first course, we had Wagyu Beef Sashimi served carpaccio style on a himalayian salt block, veal bone marrow and Cesar salad. They make the Cesar salad at the table to our specifics… It was all great. 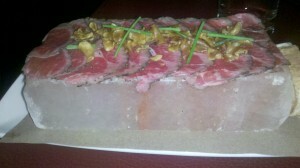 I loved the addition of salt that the Himalayan Salt Block imparted on the beef. 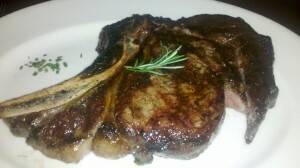 Our second course was the steak- a 55 days dry aged ribeye and the south side fillet in the bone. I loved that ribeye! yum! Joe liked both. He kept trying to pick a favorite but failed…he just enjoyed them so much! I’ve never seen him this happy. 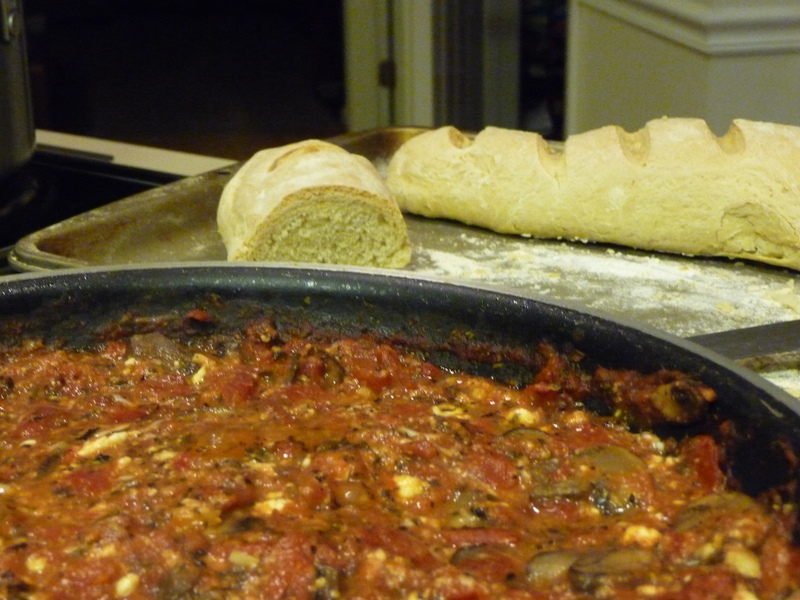 For the sides, we picked the mushrooms and the gnocchi. I would recommend the mushrooms but not the gnocchi. They were a little bland. Finally, the dessert course… Somehow, we managed to eat a little more… Joe picked the banana split with salted caramel chocolate ice cream made on Himalayan Salt Block , caramelized bananas, roasted pineapples and pecans. I had the doughnuts. 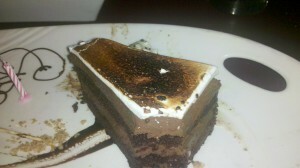 They also brought us a delicious devil food cake for Joe’s birthday. I would recommend the banana split and the cake… the doughnuts weren’t anything great. Beside excellent food, I was very impressed with the service- everyone was very courteous and friendly but not overly attentive. Overall, I would recommend this restaurant for special occasion. Ok, I miss it! With exams coming, I’ve been thinking about my amazing trip. 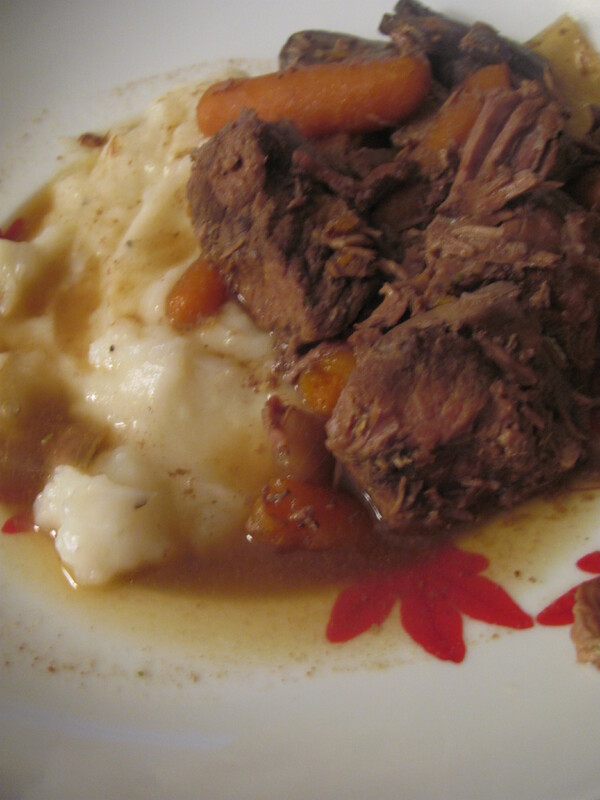 I made some Flemish stew in the slowcooker… I did have a similar dish when I was in Brussels. Of course, they would have served it with french fries and I wanted mashed potatoes. It was great and perfect for these cold November days. P.S. Enter my latest giveaway! Post exams… as I was sitting around brain dead (well, I’m still quite brain dead but recovering)… I started cooking… so get excited… many yummy posts to come… this recipe is my go to feed an army meal… it is easy, delicious, and versatile… Sometimes I add the shrimp… this time I kept things simple and halved the recipe, which was still enough for four people with leftovers.Â I served it with some bread and salad. In a frying pan, sprayed with Pam, sautÃ© mushrooms until tender, about 8 minutes. Add tomatoes, basil, parsley, garlic, and red pepper, if desired; stir until heated through. Mix in both cheeses. Meanwhile, cook linguine in large pot of boiling salted water until tender but still firm to bite. Drain. Return to pot. Add 1 tablespoon oil; toss to coat. 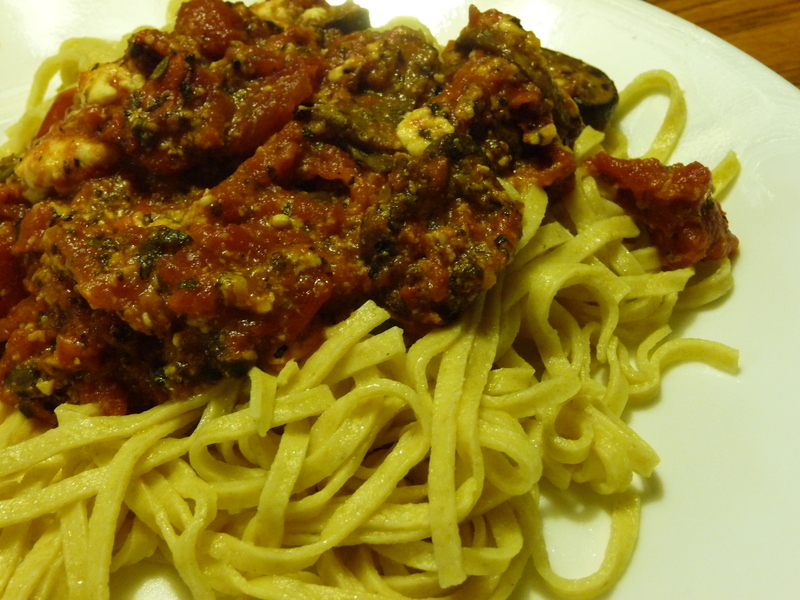 Add mushroom-tomato mixture to pasta; toss to coat. Season with salt and pepper. Transfer linguine to large bowl.